Article highlights the impact of a Brexit (pullout of the UK out of the European Union) on the financial markets within the first 6 months after a theoretical leave vote - says it will be devastating, it would make stocks tank by 15%. This is opposed to a 5% rise in stocks, in the event of a "Remain" vote .. 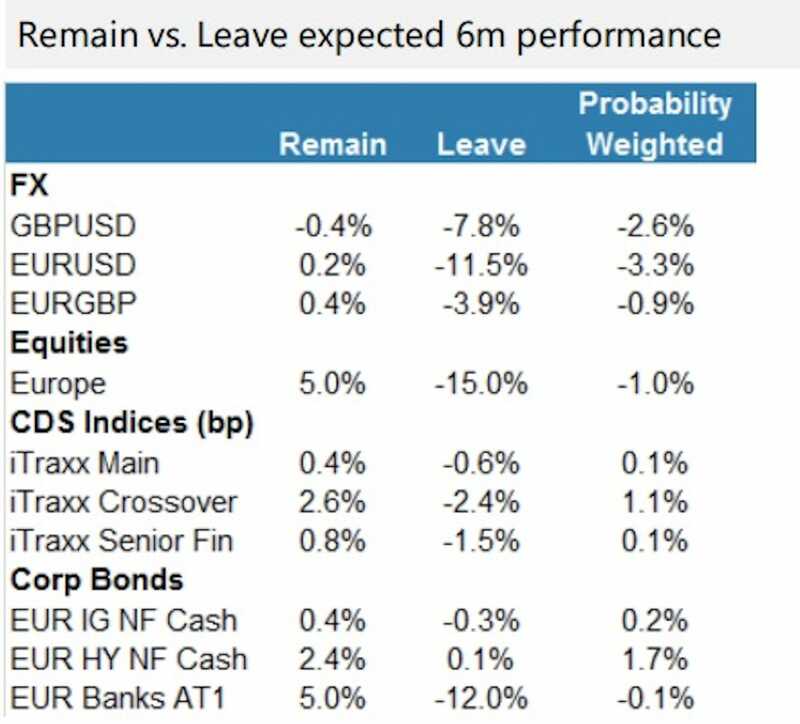 The bank calculates a 30% probability that Britain will leave the EU. Well they had better get used to the Idea. Nobody in the UK ever wanted the country to be turned into an Islamic State, something that seems to be happening as numbers grow. Now the consequences of being gracious are all too apparent. Horrific events throughout the world ... some perpetrated by so called British nationals .. have focused attention. Unlike with other religions, integration has demonstrably failed. There is more investigation and searching as to what Islam is all about, something political leaders of yesteryear utterly failed to do, except for one Enoch Powell. The result is horrifying many people. Brexit is not about economics. It is not about living standards. It is about the place being swamped by an unwanted political system. For those who need a quick lesson about Islam. The following seems to be a fair presentation. It refers to the substance, of the 'holly text' and NOT with the attitudes of individuals. It is apparent that Islam is NOT simply another denomination of Christianity. Indeed the Quran explicitly says Jesus was never Crucified.